The man in the leather apron was holding up a piece of wood carved roughly into the shape of a foot. Slowly and carefully he showed the ten-month progress from its soles to its uppers, and how they were finally joined together. Hooray for the work of human hands! 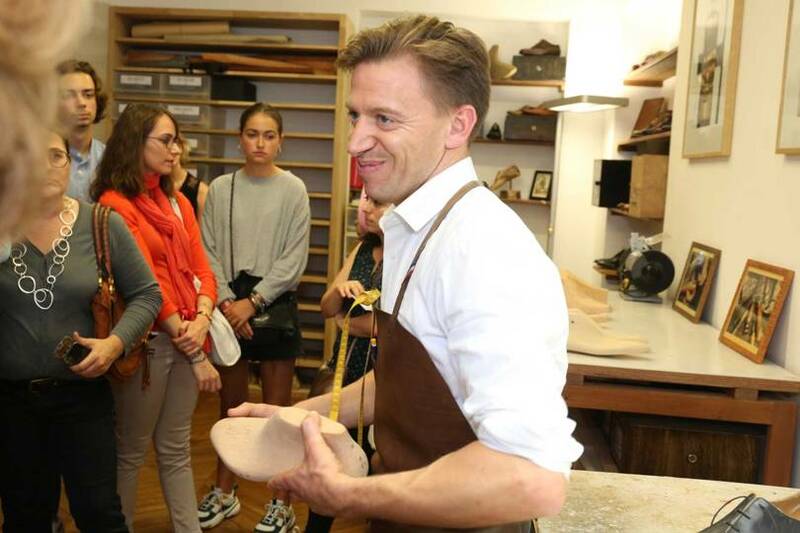 My visit to the handmakers at Berluti, in what is known as the “golden triangle” – high-end Paris edging the Champs-élysées – was just one of many events offered by LVMH – the luxury goods company with tentacles stretching across the world. I was lucky enough to jump the four-hour-long queue of people waiting to enter the house of Christian Dior. Up the stairs, where glamorous ball gowns with ballooning skirts were set out on mannequins, I followed the first visitor group into a room where little doll-figures wearing miniature versions of couture were displayed. Other areas showed seamstresses at work or the variety of processes for watches or handbags. Bernard Arnault, Chairman and CEO of LVMH, raised his camera to snap decorative baby clothes and studied mad hats produced for Dior by milliner Stephen Jones. 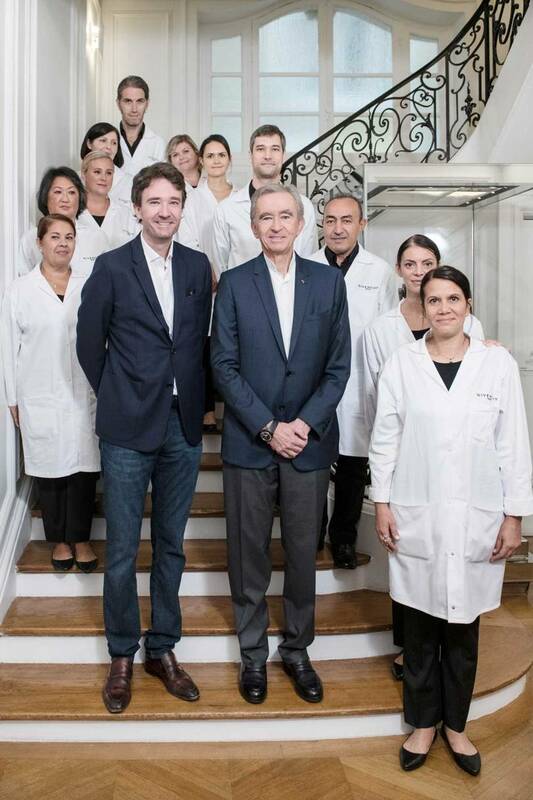 With Antoine Arnault, the founder’s eldest son who instigated Les Journées Particulières LVMH – a three-day weekend of “open house” events – the head of the luxury empire moved through different areas at Dior. One showed a line-up of toiles – the plain, white-cloth dresses that are the first stage of couture workmanship. 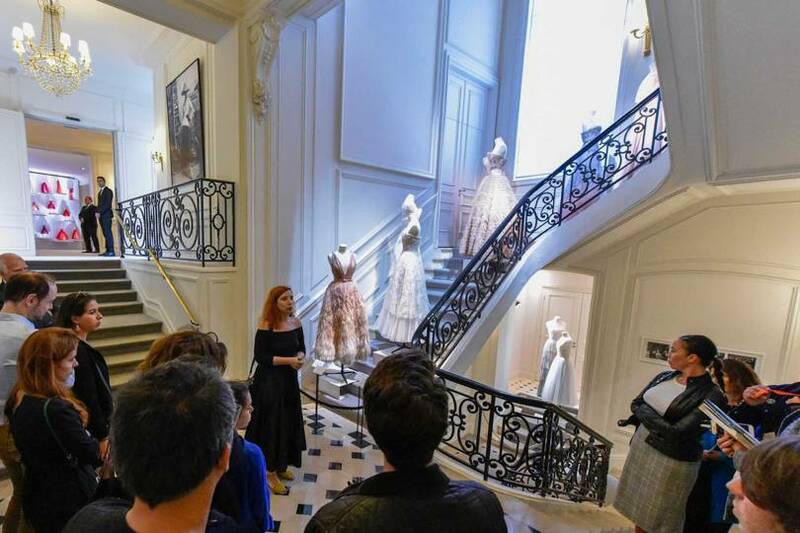 The same idea of development was open to the public at Givenchy: Up the grand staircase, past a picture of the founder and films of him with his muse Audrey Hepburn; and then a recreation of grand gowns that current Artistic Director Clare Waight Keller showed in haute couture after she had dressed Meghan Markle, Prince Harry’s royal bride. The next room had the “petites mains” or hand-workers actually stitching the couture gowns. 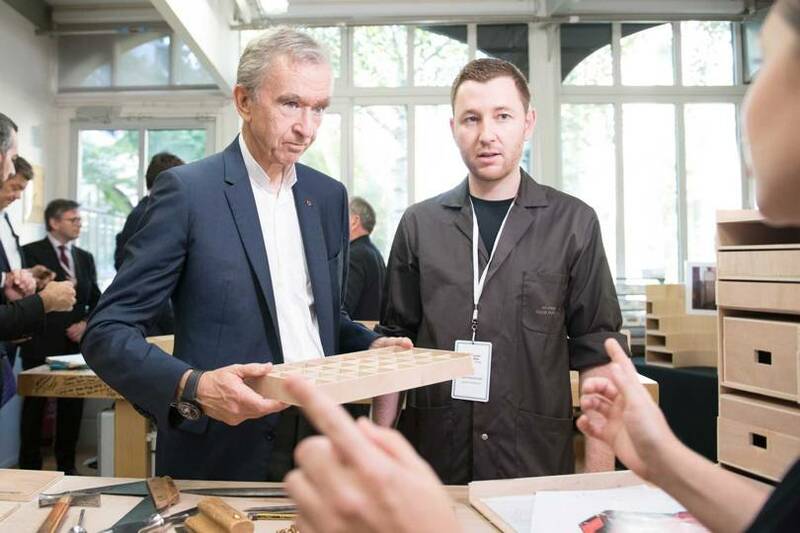 When I arrived at Asnières-sur-Seine – where the original Louis Vuitton built his trunk-making ateliers in 1859 and his son George built a house in 1892 – I asked Antoine Arnault what had compelled him to personalise LVMH, a company with a chilly, imperial feel and so many famous brands. As I took in the homey atmosphere with Art Nouveau decorative windowpanes and photos of the founders framing the walls, Antoine explained the thought and effort he had put into this fourth edition of Les Journées Particulières. 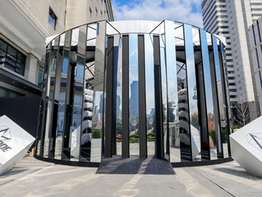 Since his first tentative efforts seven years ago, the event has now grown into a worldwide enterprise, and this year, 56 of the LVMH Maisons in 14 countries were open to the public – some for the very first time. The catalogue of brands is impressive – particularly in Europe, of course – and includes, beyond the huddle of big names in Paris, tanneries near Lyon and Christian Dior Fragrance in the South. Italy includes Pucci in Florence and Bulgari and Fendi in Rome; Germany has Rimowa luggage; Spain is home to Loewe in Madrid; and Switzerland to watch companies. The list seems endless, even before looking beyond Europe to the rest of the world. But can such a huge company really be local as well as global? For the visitors –90% of whom were female on the days I visited – there is the fascination of seeing beautiful objects and understanding how they are made in their most rarefied versions. By contrast, a Louis Vuitton duty-free boutique at the airport is unlikely to offer a traditional LV patterned trunk, lined in scarlet, with all the accoutrements of a Chinese tea ceremony. And the intense embroidery – taking 650 hours of handwork, which Natalia Vodianova, Antoine’s partner, showed their son Maxim – will not be on offer in any Dior store, however swanky. This "Lonely Planet" tour of luxury hot spots is surely designed to create not just desire, but also to encourage customers, who are increasingly buying online, to re-embrace the idea of place; to re-kindle the joy of shopping; and to offer miraculous human handcraft as an antidote to fast fashion. There is also an element of celebrity watching, occasionally openly, with photos of the famous who are loyal to a brand. Other times the effect is subtle, as in Berluti lining up the moulds of a well-known client’s feet, even if, as in the case of Pierre Bergé, partner to Yves Saint Laurent, he had passed away. The brand easiest to embrace was Sephora, which used its university in Neuilly, on the outskirts of Paris, to show how it encourages imaginative outsiders to join the empire. 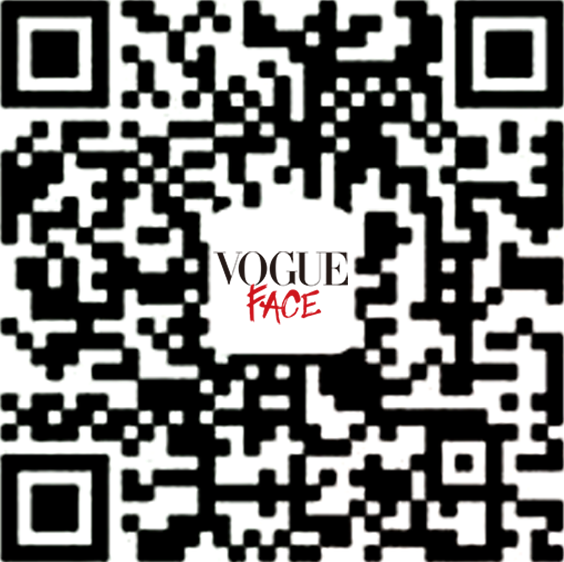 Among LVMH’s well-known brands – from historic houses like Guerlain to classics including Givenchy, Marc Jacobs, and Kenzo to celebrity brands such as Fenty Beauty By Rihanna – there were newbies. I met Anju Rupal, who is part of Sephora’s “Accelerated Cohort”. Originally from India, she now works out of Switzerland and includes in her organic beauty-making the importance of planting trees and helping young Indian women go to school. 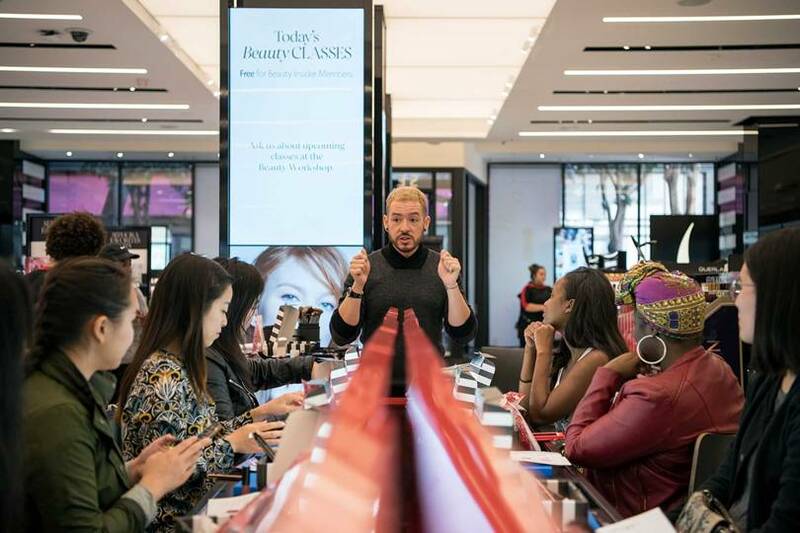 The Sephora Global CEO of the last seven years, Christopher de Lapuente, insisted that among the massive growth to 2,700 stores in 34 countries, he encouraged originality and surprise. Sephora is also one of the rare LVMH affordable brands. Even an expensive fragrance costs less than a scarf at the couture houses and a fraction of the jewellery brands. Having involved 3,000 artisans and creatives and with more than 180,000 visitors, LVMH is calling this year’s Les Journées Particulières “unprecedented”. For Givenchy’s seamstresses – some of whom have toiled in the shadows for 30 years – being brought into the spotlight seemed surprising, even bewildering. 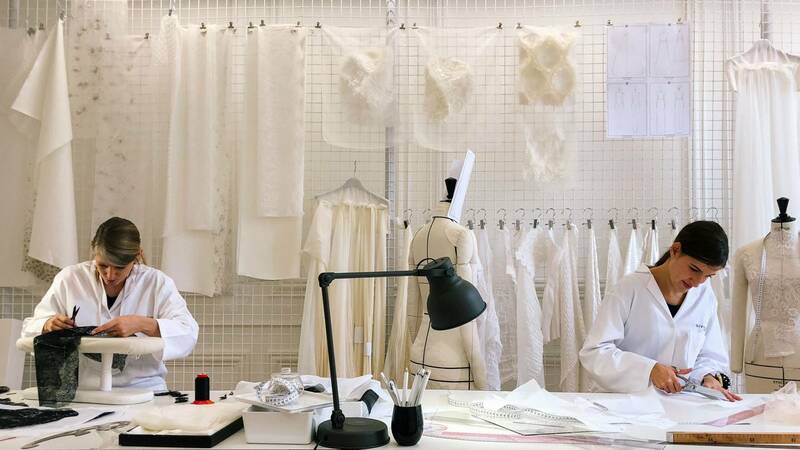 They worked in public as they do in their everyday jobs – mostly silent, eyes on the material they are shaping and stitching, answering questions politely, if asked. Maybe the finest thing to come out of Les Journées Particulières is this appreciation of the craft makers. They have progressed from “little hands” to heroes, fighting fast fashion and its sweatshop labourers by showing the nobility of their own work.